Holiday Heidi: On Holiday with Heidi eh? Well, Happy one year Anniversary!! On Holiday with Heidi eh? Well, Happy one year Anniversary!! Blogger.com keeps a log of the stats on my blog, complete with graphs, charts and percentages (all for free) I thought I'd share the statistics with you. I can check: "now, daily, weekly, monthly and all time" on things like "Overview, Posts, Traffic and Audience". I love following the stats, mainly for two reasons: one, because I'm curious to see who and from where. And second, because every day I check, I'm astonished and humbled by the findings! The 8th of March was the official Anniversary date of when I started to bring you along on my travel adventures. I am humbled, surprised and excited at how much support and interest you have shown. I have posted a total of 30 blogs thus far (still trying to post one per week). Those posts have been opened in 57 countries around the world and collectively viewed a total of 7685 times. Wow! I thank you. living in these 57 Countries! Did you know that each week when you take a few seconds to answer the weekly survey question, you drive "Holiday Heidi's" status within Google Search? It's true. As a result, the "Traffic" stats listed by blogger show that mostly people are searching specifically for 'Holiday Heidi', where others have clicked on my blog while searching Google for something else. (ie: "jigg's dinner", "bubba keg", "holiday blog", "all inclusive" etc). While I have met a few of you from some of these places, I don't have my own friends in each Country listed (not yet anyhow). Thank you for sharing with your friends, I hope they're loving the adventure too!! For the next post I'd like to tell you how 2011 went (what we did, where we went, who we met (or reunited with rather) and where we'll be checking out the sights from in 2012. I'm still working three jobs to get to where I'd like to go, have a very active social and community life in amongst all the work and travel. Sometimes I'm not sure where the energy comes from either but I believe it's this simple: I love people, travel, work and writing. And I have supporting, loving and amazing family & friends ... thank you. Weekly Survey Question: there are 196 Countries in the World (counting Taiwan), how many would you guess have reviewed this vacation blog? The majority of you (57%) guessed 26-33 Countries with only 1% of you guessing 54+. 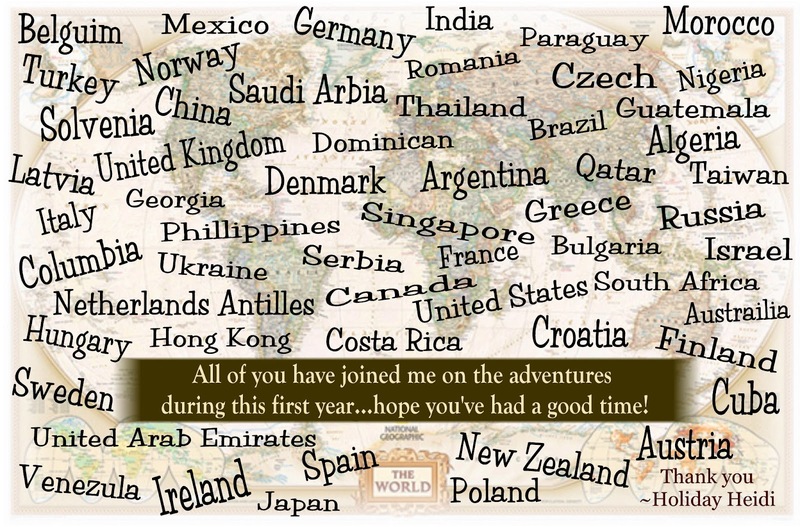 And almost as wondrous as that, I was asked after I posted this question 'how many Countries have I visited' to which I had no idea, so I tallied it up: 15 Countries since 2007. Unbelievable! How lucky is that!! 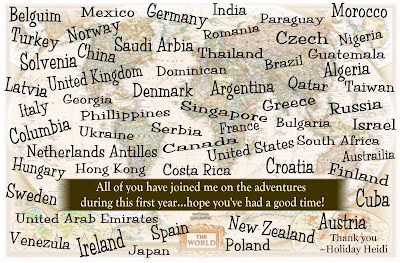 I will continue to write (and hopefully travel) ... it's fun to know that you're packing your bags and coming with me! (be sure to check out Your Adventure Map (by clicking here or at the top of this page) so you can read previous adventure posts).